John Turner (c.1590 – winter of 1620/21) was a passenger on the historic Mayflower voyage with his two sons. Turner was also one of the signers of the Mayflower Compact. Turner probably came from Great Yarmouth in the county Norfolk, where there were several Turner families at that time. Turner was a member of the Separatist church. That was a religion that was not allowed in England. Turner was one the original group who moved to Leiden Holland in 1610 to escape religious persecution with William Bradford and William Brewster. Turner was a merchant and a (political official) of Leiden. Many of these people lived in Middelburg, Holland. This is located in Zeeland. Turner also delivered mail to the Separatists from their family and friends in England. Turner also brought cargoes of English pewter from London to Holland. He also carried letters between people in Leiden and London. On June 10, 1620, Turner carried information to the congregation on the progress of their planned trip to the New World. According to William Bradford, John Turner traveled on the Mayflower with his two sons. Turner left Plymouth, England on 16 September 1620. There were 102 passengers and 30–40 crew. On 19 November 1620, the Mayflower reached land at Cape Cod hook. They landed on November 21. They wrote the Mayflower Compact, which made rules on how they would live and treat each other. John Turner signed the Mayflower Compact. The Mayflower was supposed to land in Virginia Colony, but the ship was too damaged and they were forced to land at Cape Cod now called Provincetown Harbor. After they landed, Turner was part of the group who went out on exploratory trips to look for permanent places to live. Turner was one of the Mayflower passengers who would make first contact with the Indians. Turner also had a daughter Elizabeth, who stayed in Leiden. She would have been one year old. Elizabeth Turner married and travelled to New England before October 1635. She joined the Salen Church. ↑ 1.0 1.1 1.2 1.3 1.4 1.5 1.6 Caleb H. Johnson, The Mayflower and Her Passengers (Indiana: Xlibris Corp., copyright 2006 Caleb Johnson), p. 243. 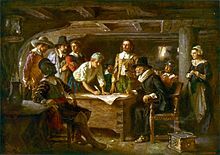 ↑ George Ernest Bowman, The Mayflower Compact and its signers, (Boston: Massachusetts Society of Mayflower Descendants, 1920), Photocopies of the 1622, 1646 and 1669 versions of the document, pp. 7-19. This page was last changed on 13 February 2018, at 09:37.